Endoscopy Support Services: Need something repaired? Need to send something in to be repaired? With E.S.S. repairs, there is no need to make any arrangements or get a "special code" to send your instrument to us. Just follow our simple and easy method! 1. Send us your broken instrument! -Fill out our Speed-Up Repair form. -Carefully box up your scope or equipment. *For flexible scopes: place the instrument in the padded case it originally came with, then tape the two halves closed with packing tape to prevent the case from opening during transit. *For rigid scopes or other instruments that don't have a padded case, carefully wrap the instrument in bubble-wrap so that it's cushioned from any shock. -Advise you on the best course of action to take with your instrument. 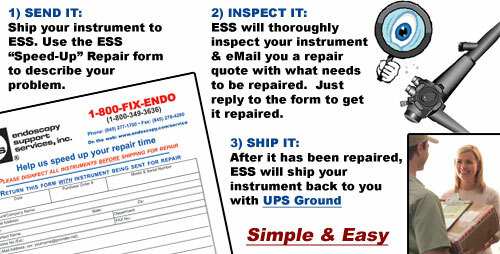 After inspecting and repairing your instrument, we will send your instrument back to you via FedEx.